Fair and Fine grained Plywood with smoothness and flexibility. Used for Classic Furniture and fittings. Worked out to enjoy the beauty of Basswood Plywood. Good for Clear Coating. Plywood produced with a special technique of not using Tape and String for surface Veneer, which removes the anxiety of Tape delamination and appearance. Top coated to protect the Fine grained and beautiful Basswood surface, which has the effect of dust-free. Used environmentally friendly material. Coating easy. Suitable for a die, for being lighter and easier to process compare with usual Lauan core plywood. Dirt-free and smooth Clear finishing, but the surface looks still natural. Carefree for condensation even in a store room since the topcoating breathes. Bend Elastically and Powerfully in order to make a beautiful curve. Available in Basswood and Lauan. Various selection of curving degree and direction. Plywood for Die to make paper boxes and etc. 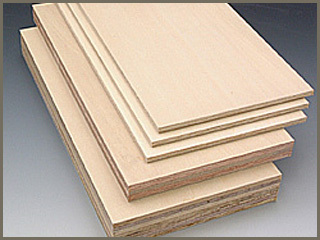 Special structure Basswood Plywood with high precision in thickness and advanced technology. Plywood infiltrated with special Fire Retardant solution. Basswood and Lauan surface are available. Plywood with Flame Retardant Performance. The fire service law designates to use this plywood for a certain usage. Laminated Veneers with all the grains running in the same direction and parallel to each other. Used as Cores and Frames.